Brothers and sisters, may you find peace in the Lord! We’re all familiar with the Bible story of Job. When he lost his family’s wealth and his children he still stood witness for God. His genuine faith is both inspiring and enviable. In fact, there are a lot of people who encounter temptations similar to Job’s in their daily lives. So when those temptations do come upon us, how should we face them, undergo them, and stand witness for God? This essay by Sister Lianying recounts how God’s words led her step by step through the temptation of losing all of her wealth. I think this will be really inspiring and helpful for all of us. “Cheated?” Lianying’s vision went blank and she nearly passed out. She gripped the phone tightly, feeling incredible anxiety. She asked her brother question after question, feeling an urgent need to understand every single thing that had happened with the factory. The minutes ticked by and every one of her brother’s answers left her with little hope. She slowly put down the phone, leaning back on the sofa and staring blankly. She felt a burst of heart-wrenching pain that her waif-like frame could hardly withstand. After her husband heard the news he rushed home from his job at the clinic. “We invested over a million and that’s all gone? That’s the hard work of half of our lives! No, it can’t be! I need to go to Guangdong.” He waved his hands around and looked at the clock to see what time it was. Lianying’s heart was racing and she was anxious to hop on a flight to Guangdong. The next day she didn’t feel like talking to anyone. She had never imagined that her hard-earned money would just fall prey to someone’s cheating, all for nothing. She couldn’t wrap her head around it—how could a factory that had been doing such great business suddenly just becoming nothing? Could it be that they had offended someone, that someone was plotting against them or wanted to exact revenge? Thinking of all the hard work to manage the factory that ended up being closed just like that, Lianying felt like her heart had been cut open. The winter night was so quiet and long, and the clock on the wall kept ticking along. Lianying tossed and turned in bed, seeing that it was already 3 a.m. She so hoped that this had all been a bad dream. Sister Dong poured a cup of hot water for Lianying. Feeling that warmth from her, Lianying poured out her heart to Sister Dong. Sister Dong spoke while turning on her tablet computer, then read: “Sometimes God allows Satan to do something. Some disasters are carried out by Satan, but it is what God has arranged and allowed; it is God’s maneuvering. Satan is a tool in God’s hands! Isn’t that the truth? (It is.) This was exactly the case in the example of Job’s trials. What was the root of Job being tested? (God and Satan making a bet.) God made a bet with Satan, allowing it to tempt and attack Job, and as a result when Job was just living his life, he was suddenly robbed; quite a few other things like that happened in just one day! If someone didn’t know that God and Satan had made a bet in the spiritual world, looking at it from the material world they would think: ‘Wasn’t that a calamity coming upon Job? Didn’t he suffer an attack by those robbers? How could that have anything to do with God? Most likely Job had done something to offend the robbers!’ Isn’t that what people think? (It is.) That’s what it looks like from the outside, but is this thinking wrong? It is and it isn’t, but if you think that’s all there is to it, that’s wrong. While thinking that you have to see that behind the scenes, God is ruling and arranging all things, that He orchestrates everything. God allowed the robbers to do that, otherwise who could do anything to Job? No one would be able to. You can see from this how fully you understand this issue. If you just look at the surface of it you won’t recognize that it was God’s rule and arrangement, that it was God’s action and He was bringing all things into play so they could do service to perfect Job. That means that you’ve been deluded by the superficial presentation of this, and you will never grasp the truth and essence behind it. Are there a lot of people like that? (Yes.) How many? (Almost everyone thinks that.) All of us frequently think that way, and no one is an exception. We all think of things on the most superficial level and we fail to think of what is just below the surface. … What’s the problem here? It’s not recognizing God’s rule and arrangements, being unable to grasp God’s will. That’s the root of it” (“Sermons and Fellowship About God’s Word ‘God Himself, the Unique III’ (III)” in Sermons and Fellowship on Entry Into Life (XIII)). After she got home Lianying looked much less anxious and her state had taken a dramatic turn for the better. She no longer felt entwined in the question of whether their wealth had suffered from others’ schemes. 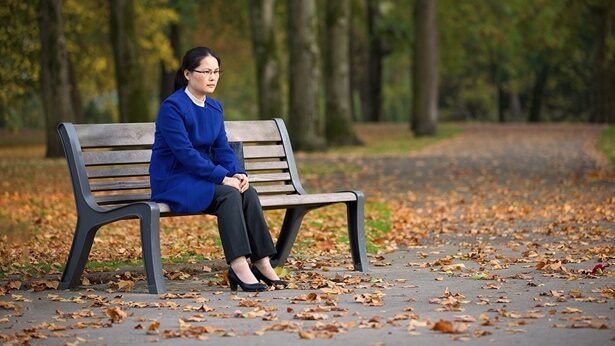 But after quieting her heart and then thinking of the money she had lost, over 1 million yuan, she couldn’t help but still feel anxious and upset. Before she knew it, she no longer had the heart to perform her duty. In her pain she came before God many times in prayer and seeking: How could she actually come out from that state? One day, while doing her devotionals Lianying read these words from God: “Something is revealed through the human disposition of the people in this world, including each and every one of you. How is this interpreted? It’s the worship of money. Is it hard to get this out of someone’s heart? It is very hard! It seems that Satan’s corruption of man is thorough indeed! So after Satan uses this trend to corrupt people, how is it manifested in them? Don’t you feel that you couldn’t survive in this world without any money, that even one day would just be impossible? (Yes.) People’s status is based on how much money they have as is their respectability. The backs of the poor are bent in shame, while the rich enjoy their high status. They stand tall and proud, speaking loudly and living arrogantly. What does this saying and trend bring to people? Don’t many people see getting money as being worth any cost? Don’t many people sacrifice their dignity and integrity in the pursuit of more money? Don’t many more people lose the opportunity to perform their duty and follow God for the sake of money? Isn’t this a loss for people? (Yes.) Isn’t Satan sinister to use this method and this saying to corrupt man to such a degree? Isn’t this a malicious trick? As you progress from objecting to this popular saying to finally accepting it as truth, your heart falls completely under Satan’s grasp, and therefore you unwittingly come to live by it” (“God Himself, the Unique V” in The Word Appears in the Flesh). Lianying carefully pondered God’s words. She then understood that the reason she couldn’t let go of her million-yuan loss was that she saw money as too important, always feeling that in this technologically-advanced, materialistic, money-focused society, being poor couldn’t be okay, and that in their lives people should work to earn money by relying on their own ability. She thought that having money meant having everything, that it brought authority, status, and the admiration of others, that only living that way had value and meaning. She had taken satanic laws for survival such as “money above all” and “money can’t achieve everything, but without money you achieve nothing” as her own personal mottos. As a result, losing money was like losing half of her life. The more she thought this over, the more Lianying’s heart brightened. She realized that money had become her very life long before, and that Satan was using fame and money to keep firm control over her, dragging her farther from God step by step. She thought of the Lord Jesus’ words: “For where your treasure is, there will your heart be also” (Matthew 6:21). “For what is a man profited, if he shall gain the whole world, and lose his own soul? or what shall a man give in exchange for his soul?” (Matthew 16:26). “There is a sore evil which I have seen under the sun, namely, riches kept for the owners thereof to their hurt” (Ecclesiastes 5:13). She discovered that she was entirely preoccupied with her desire for money every single day and had not been performing her duty well. In her faith, she had tried to keep her feet on two boats: money, and the truth. If she continued on that way until the conclusion of God’s work, God would destroy her for having failed to gain the truth! Lianying understood that God allowing that kind of trial to come upon her was not to have her experience fleshly suffering, but was to better save her! Lianying let out a long breath and lifted her head a bit to look out the window. The sun had come out and the snow on the ground was sparkling; she realized how beautiful winter mornings are. She then felt much more relaxed and was full of gratitude to God. The clinic that Lianying’s family had been running for three decades had a great reputation, but her husband fell ill. She not only needed to take care of him, but also had to manage the clinic. She was overwhelmingly busy. Lying in bed, he thought it over. Her husband considered it for a little while and then agreed to her idea. Lianying drew up and signed a private agreement with the apprentice, Wu Mei, to have the management of the clinic temporarily handed over to her until Lianying’s husband had fully recovered, at which point he would resume management authority. A year later when he had regained his health, Lianying and her husband went to see Wu Mei in preparation to return to their family clinic. In the car on the way there as her husband was driving, dark clouds suddenly bore down and it started raining. Looking out of the window, all Lianying could see was a thick gray haze. “You own your own house and your own car. I’ve been managing the clinic for almost a year and I’ve just bought a house, but no car yet. Didn’t you used to say that you would treat me just like your own child? Since that’s the case, just let me keep running the clinic, okay? If I go somewhere else I won’t have any business, so it would be better for you to find another place. If you’re going to be a good person and help someone out, don’t do it halfway.” Wu Mei sat there on the sofa with an imperious air. It seemed that Wu Mei had become an entirely different person in just one short year. Lianying looked at her and found it hard to believe that she could do something like that just for the sake of money. She felt helpless in the face of it, and a wave of pain welled up in her heart. No matter what they said to her, Wu Mei had no intention of backing down. Lianying no longer wanted to waste her breath; she could only return home and think of another plan. But when she thought of the clinic they had worked so hard to run over the last three decades and the current state of affairs, she and her husband really couldn’t swallow it. He fell ill and became bed-ridden again. Lianying was infuriated, and she went to the clinic one more time to try to reason with Wu Mei, but no matter what she said, Wu Mei would not hand the clinic back to them and had absolutely no intention of compromising. “Don’t even think of getting the clinic back. We won’t give it to you. You’ve been doctors for many years and you could go anywhere to open a clinic—it’d all be the same.” Wu Mei’s mother-in-law was leaning against a medicine cabinet with such a cold expression that Lianying truly did feel chilled. Wu Mei and her family all chimed in, but all that came out of their mouths were absurdities. Lianying felt very pained and was so angry she couldn’t utter a single word. Both her hands were shaking and her entire body was constantly shivering. She didn’t have an ounce of strength, and couldn’t even stay standing steadily. Seeing the clinic she had worked so hard to manage for three decades being forcibly occupied by someone else, she felt as if her insides had been ripped out, as if everything had been sucked out of her. Lianying’s legs felt leaden—she didn’t know how she even walked home. Right after she got back her family and friends all arrived. They knew the answer from the look on her face, and everyone jumped into a lively debate. Hearing all these things her friends and relatives had to say, her mind was whirling: “That apprentice doesn’t care if we live or die. It looks like she’s going to behave shamelessly until the very end, so why should I have any regard for her? I’ll let them deal with it; my husband and I won’t show our faces.” For a moment Lianying felt emboldened and decided to let them resolve the issue. But then she suddenly felt uneasy and realized that as a Christian, if she acquiesced to her family getting the clinic back through drastic means, would that really be in line with God’s will? Wasn’t that using human solutions and resolving the issue through hot-bloodedness? A passage from Sermons and Fellowship then occurred to her: “When trials befall you, remember first to hurry and pray before God to grasp God’s intention and know God’s love, which is most important. You will be in trouble if you run to Satan instead. When Satan tells you some nonsense, you will be confused, and you will betray God. Therefore you need to hurry and come before God so Satan will have no opportunity to exploit. If you go to those unbelievers for consultation, then you will be done for even more. You will give Satan an opportunity to exploit. You will only blame God, and then use the methods of man to eliminate, escape from and resolve them. And you will end up with nothing” (“Only by Satisfying God’s Final Requirements Can One Be Saved” in Sermons and Fellowship On Entry Into Life (II)). After she was done praying, Lianying read a passage from Sermons and Fellowship: “One thing we’ve seen from the Bible is that there’s a person named Job in it. He feared God and shunned evil, and at the time he was a perfect person. In order to test him, God made a bet with Satan which resulted in trials befalling him. Then within a single day, all of Job’s family wealth and a mountainside of livestock were all taken from him by robbers. Even his house was burned down—everything he owned was gone. At the time Job was not sinful; he was a God-fearing man, a perfect man. Everything he had was God’s blessing, was bestowed upon him by God. So what did Job have to say when this kind of trial befell him? Did he blame God? Not even a little bit. So what did he say? He said: ‘Jehovah gave, and Jehovah has taken away; blessed be the name of Jehovah’ Job did not complain. When this came upon Job, was he at fault at all? He wasn’t. 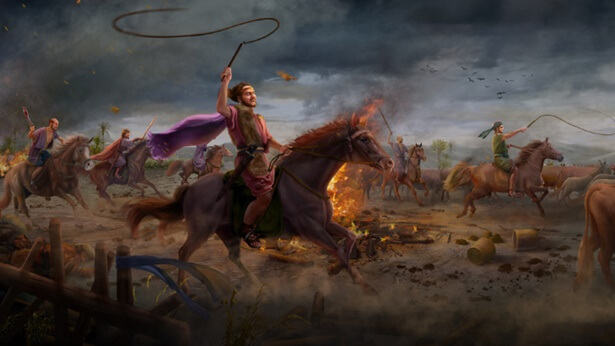 Disaster suddenly struck from the heavens and all of his wealth was ruined, yet he didn’t have a word of complaint” (“How to Achieve True Self-Knowledge” in Sermons and Fellowship on Entry Into Life (I)). Lianying sat at her desk and gave it some serious thought. Why was it that Job was able to fear God and shun evil, that he was a perfect person in God’s eyes? When Job encountered that trial all of his wealth and his children were taken away, yet he didn’t complain, show any hot-headedness, resolve it through human means, start conflict or try to settle accounts with other people. Rather, he praised and paid tribute to God. When Job was faced with a trial he especially wasn’t deceived, roped in, or tempted by others, but he was able to calm himself down and seek the truth, in the end standing witness. He said: “Jehovah gave, and Jehovah has taken away; blessed be the name of Jehovah” (Job 1:21). One day, Lianying was in her living room watching a video, earnestly listening to a recitation of God’s words. “Common sense dictates that, having been given such abundant assets by God, Job should feel ashamed before God because of losing these assets, for he hadn’t looked after or taken care of them, he hadn’t held on to the assets given to him by God. Thus, when he heard that his property had been stolen, his first reaction should have been to go to the scene of the crime and take inventory of everything that had gone,[c] and then to confess to God so that he might once more receive God’s blessings. Job, however, did not do this—and he naturally had his own reasons for not doing so. In his heart, Job profoundly believed that all he possessed had been bestowed upon him by God, and had not come off the back of his own labor. Thus, he did not see these blessings as something to be capitalized upon, but took holding on to the way that he should by tooth and nail as his living principles. He cherished God’s blessings, and gave thanks for them, but he was not enamored of, nor did he seek more blessings. Such was his attitude toward property. He neither did anything for the sake of gaining blessings, nor worried about or was aggrieved by the lack or loss of God’s blessings; he neither became wildly, deliriously happy because of God’s blessings, nor ignored the way of God or forgot the grace of God because of the blessings he frequently enjoyed. Job’s attitude toward his property reveals to people his true humanity: Firstly, Job was not a greedy man, and was undemanding in his material life. Secondly, Job never worried or feared that God would take away all that he had, which was his attitude of obedience toward God in his heart; that is, he had no demands or complaints about when or whether God would take from him, and did not ask the reason why, but only sought to obey the arrangements of God. Thirdly, he never believed that his assets came from his own labors, but that they were bestowed unto him by God. This was Job’s faith in God, and is an indication of his conviction” (“God’s Work, God’s Disposition, and God Himself II” in The Word Appears in the Flesh). After watching this recitation of the passage of God’s words, Lianying felt suddenly enlightened. She could see from Job’s attitude toward his family wealth that he recognized God’s rule and knew that everything he had was given to him by God, and that God taking it away at any time was God’s own affair; whatever God did would be right. Whether He allows someone to be blessed, to suffer calamity or pain, they must accept and submit to it because people are nothing more than miniscule beings of creation who are not qualified to complain to God or demand anything of Him. They are particularly not qualified to make assessments of God’s deeds. Lianying saw that she still didn’t possess the rationality of Job, always thinking that it was she who had earned her family’s fortune, that it was because of her skill and capability. That was why it was so painful for her when she lost it, and she even fell into Satan’s snare, complaining to God and nearly losing her testimony. Lianying’s eyes moistened with tears. She saw that in Job’s faith and his path following God, what he focused on was how to follow God’s way, how to stand witness for God and glorify Him. That is why he was able to calm himself, pray, and seek God’s will when such a great trial befell him, and why in his heart he only thought of how to satisfy God, the Lord of creation. Job bore a resounding witness before Satan and all of mankind. His faith, obedience, and reverence for God defeated Satan, shaming the devil, and in the end was praised by the Lord of creation. Job’s testimony was incredibly moving for Lianying. It was then that she finally understood God’s will, that God allowing that kind of trial to come upon her was to have her recognize God’s rule and perfect her true faith in God so that she would be able to have true obedience and reverence for God through trials and refinement. If she just praised God when everything was smooth sailing but in trials and adversity denied Him and complained to Him, how could that count as someone with true faith? Another passage of God’s words then came to mind, and she hurriedly grabbed her book of God’s words from the coffee table, opening it up to: “Man’s life originates from God, the existence of the heaven is because of God, and the existence of the earth stems from the power of God’s life. No object possessed of vitality can transcend the sovereignty of God, and no thing with vigor can break away from the ambit of God’s authority” (“Only Christ of the Last Days Can Give Man the Way of Eternal Life” in The Word Appears in the Flesh). Lianying understood that the heavens and earth and all things originate from God, so wasn’t everything they had also bestowed by God? She and her husband were just average people who weren’t highly educated. If it hadn’t been for God’s care and protection, how would they have been able to start with nothing, then open a clinic, and then open a factory? Wasn’t all of that due to God’s rule and arrangements? When Satan made its accusation it was God allowing Satan to have a temptation befall her. Someone schemed against the factory and it was closed, and the clinic was taken over by a trusted apprentice. She had once again become someone who owned nothing. All of that contained temptations from Satan, but more than that, it was God perfecting her! All worldly possessions are things we do not bring with us from birth, and things we cannot take with us through death. But in this worldly life of hers, she was fortunate to have heard God’s voice and experienced the leadership and cleansing of God’s words. That is what is most precious! Lianying then thought of Job understanding God’s will when trials befell him, that he stood witness for God and was fortunate enough to see God’s back. At that time a trial had come upon her and she should also submit to God’s rule just as Job had, standing witness for God and be capable of developing true understanding of God within that environment. Even though submitting meant accepting a great deal of suffering and possibly facing financial difficulties, mockery from others, and the distancing of friends and family after losing her wealth, she knew that it was God’s blessing coming upon her and that He was giving her a chance to stand witness for Him. No matter how much she suffered or how many tears she shed, she was willing to follow Job’s example and stand on God’s side. 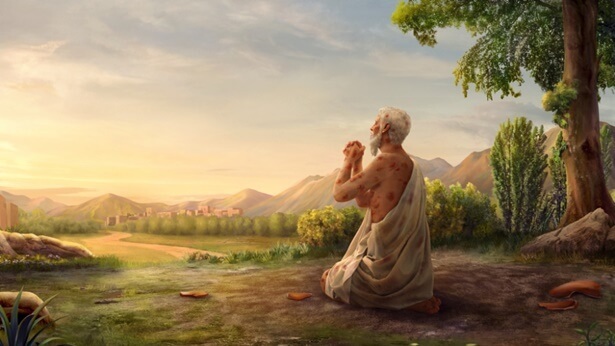 Just then a passage of God’s words rose to the surface of Lianying’s mind: “Each time they put the truth into practice, each time they undergo refinement, each time they are tried, and each time God’s work comes upon them, people endure extreme pain. All of this is a test for people, and so within all of them there is a battle. This is the actual price that they pay. … If, on the road to loving God, you are able to stand on the side of God when He does battle with Satan, and you do not turn back to Satan, then you will have achieved the love of God, and you will have stood firm in your testimony” (“Only Loving God Is Truly Believing in God” in The Word Appears in the Flesh). Having understood God’s will, Lianying felt like an entirely new person in body and spirit. Early in the morning when the air was fresh, a patch of rosy clouds appeared in the east just as Lianying was in her room listening to hymns of God’s words through earphones. Her husband was by her side doing his exercises. “Tingting.” Seeing that her second daughter had come home, Lianying stood up in excitement. After they finished eating Tingting went to put her clothes away; Lianying went over to help her. Hearing what her daughter had to say, tears formed in Lianying’s eyes. She was incredibly moved and she knew that this was God opening up a way forward for her, that it was His grace. She praised God’s love in her heart. Every time Lianying thinks back on that experience, she has a feeling of warmth and that God being concerned for her is a very happy thing. Although she suffered a bit through her trials and refinement, shed many tears, and was very sad, after undergoing all of that Lianying came to understand God’s kind intentions. She became willing to perform her duty well and pursue the truth from then on so that she could repay the grace of salvation given to her by God.